Denton is a city located in the territory of Texas. The city of Denton is the administrative center of Denton County. It has a population of about 120 000 people. In Denton are two public universities - the University of North Texas, the largest university in North Texas and the women’s University of Texas. In both universities are taught more than forty-five thousand students. Because of these two universities Denton is often taken for a college town. A free grant of land causes the creation of Denton County in 1846 and the city in 1857. The city and County have the name of the Texas Militia Captain John Denton, who was killed by Keechi Indians in 1841. The creation of two universities in the city helped to distinguish it from neighboring regions. As a result of the creation of the universities, educational services played a greatest role in the economy of the city of Denton. The city is known for its active musical life. In Denton are organized major jazz festivals and music events that attract over three hundred thousand people. Unlike other cities, located in North Texas, Denton has no data that in the area where the city is now, lived tribes. Europeans began to settle in the area since the early nineteenth century, when William Peters from Kentucky received land granted by the Congress of Texas. He called it Peter's Colony in 1843. 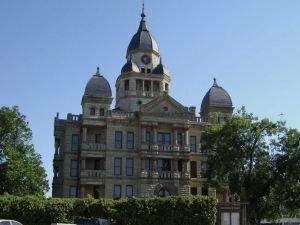 In 1866 Denton was officially recognized as a city. It expanded rapidly and became an agricultural trade center and industrial city. In 1881, with passage of the railway line, the city's population increased dramatically. Denton became a college town where in 1890 was founded the College of North Texas, which is now the University of North Texas. In 1903 was founded the Industrial College for Girls, which became the Women’s University of Texas. Denton was growing rapidly and the population in 1960 was 26 844 people, in 1980 it was 48 063 people. In the early twenty-first century the population had doubled. In spring, 2006, it was clear that several historic buildings will be demolished to build new a shopping center in their place. City residents protested against the project because they wanted to preserve the historic street Fry, where there are beautiful old buildings. In 2010 the project was approved. In the city of Denton hosts different exhibitions and events that attract many tourists. The biggest musical event is Denton Arts and jazz Festival. The town hosts the annual fair and rodeo of North Texas, which was first started in 1928. The fair lasts nine days and attracts over one hundred and fifty thousand people. The town conducts the Denton Festival of light, during which the whole city is in lights. In Denton is held an Air Fair and since 1998 is held an air show in Denton. The University of North Texas houses the music college that promotes a culture of live music in Denton. In the mid-twentieth century, in the college was founded a jazz training program for students, which was the first such program in the country. Over the years the college center for experimental music and inter- media has become an important center for music research and creation of new musical projects.